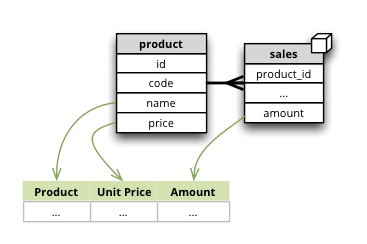 This section contains example database schemas and their respective models with description. The examples are for the SQL backend. Please refer to the backend documentation of your choice for more information about non-SQL setups. Developer’s reference of model classes and fucntions. Synopsis: Fact table has the same name as the cube, dimension tables have same names as dimensions. Fact table is called sales , has one measure amount and two dimensions: store and product . Each dimension has two attributes. Synopsis: Dimension is represented only by one attribute, has no details, neither hierarchy. Similar schema as Simple Star Schema Note the dimension year which is represented just by one numeroc attribute. It is important that no attributes are specified for the dimension. There dimension will be referenced just by its name and dimension label is going to be used as attribute label as well. Synopsis: dimension tables share a common prefix, fact tables share common prefix. In our example the dimension tables have prefix dim_ as in dim_product or dim_store and facts have prefix fact_ as in fact_sales. 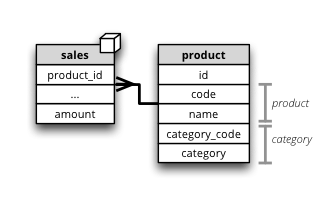 Synopsis: all tables are stored in one common schema that is other than default database schema. 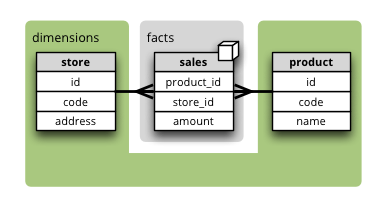 Dimensions can be stored in a different database schema than the fact table schema. There are several options how the case of multiple dimension members per fact can be solved. Each has it advantages and disadvantages. Here is one of them: using a bridge table. We can solve the problem with adding a bridge table and by creating artificial level representative_group . This group is unique combination of representatives that were involved in an interaction. You might have noticed that the bridge table is hidden – you can’t see it’s contents anywhere in the cube. There is one problem with aggregations when such dimension is involved: by aggregating over any level that is not the most detailed (deepest) we might get double (multiple) counting of the dimension members. For this reason it is important to specify all higher levels as nonadditive for any other dimension. It his case, backends that are aware of the issue, might handle it appropriately. Some front-ends might not even allow to aggregate by levels that are marked as nonadditivy . Following patterns use the Explicit Mapping. Synopsis: table column has different name than a dimension attribute or a measure. In our example we have a flat dimension called year , but the physical table column is “sales_year”. In addition we have a measure amount however respective physical column is named total_amount . If the alias follows dimension naming convention, as in the example, then no mapping is required. Following patterns show how to specify one or multiple dimension hierarchies. Synopsis: Dimension has more than one level. Product dimension has two levels: product category and product . 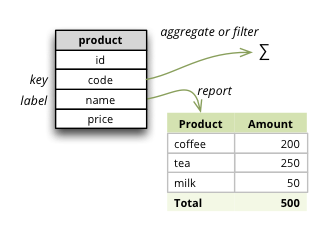 The product category level is represented by two attributes category_code (as key) and category. The product has also two attributes: product_code and name. Synopsis: Dimension has multiple ways how to organise levels into hierarchies. 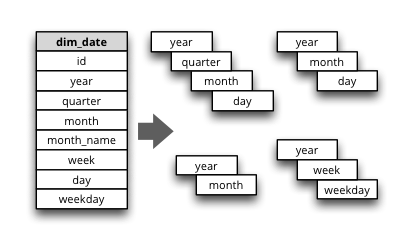 Dimensions such as date (depicted below) or geography might have multiple ways of organizing their attributes into a hierarchy. The date can be composed of year-month-day or year-quarter-month-day . To define multiple hierarchies, first define all possible levels. Then create list of hierarchies where you specify order of levels for that particular hierarchy. The default_hierarchy_name specifies which hierarchy will be used if not mentioned explicitly. Joins should be ordered “from the master towards the details”. That means that always join tables closer to the fact table before the other tables. Labels are used in report tables as column headings or as filter descriptions. Attribute (and column) names should be used only for report creation and despite being readable and understandable, they should not be presented to the user in the raw form. Dimension attributes might have language-specific content. 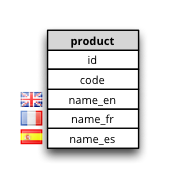 In cubes it can be achieved by providing one column per language (denormalized localization). The default column name should be the same as the localized attribute name with locale suffix, for example if the reported attribute is called name then the columns should be name_en for English localization and name_hu for Hungarian localization. The browser instance will now use only the French localization of attributes if available. In slicer server requests language can be specified by the lang= parameter in the URL. The dimension attributes are referred in the same way, regardless of localization. No change to reports is necessary when a new language is added. 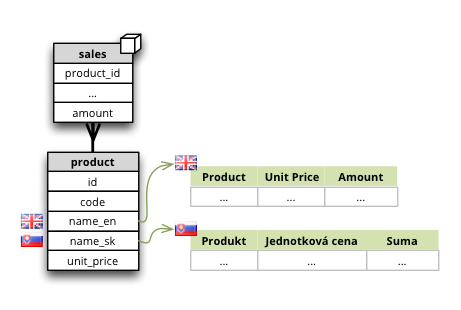 Synopsis: Labels of model objects, such as dimensions, levels or attributes are localized. Way how model is localized is not yet decided, the current implementation might be changed. We have a reporting site that uses two languages: English and Slovak. We want all labels to be available in both of the languages. Also we have a product name that has to be localized. The cubes.Workspace.browser() method creates a browser with appropriate model localization, no explicit request for localization is needed.